As you enter Crediton from the northwest you pass the 30mph sign and continue 2/10 of a mile when you will see Crediton Hospital on you right with pedestrian operated traffic lights almost opposite the entrance. Continue a further 2/10 mile and you will see the entrance to Queen Elizabeth Community College on your left. Immediately after this entrance there is a semi-detached Victorian property and then Wistaria Dental Practice on the left just before the traffic lights. The practice has no dedicated parking but you may find parking nearby by turning left at the traffic lights and either around St Lawrence Green or left, up St Martin's Lane. Failing that there is inexpensive parking in St Saviour's Car Park shown on the map above. As you enter Crediton from the southeast you will pass a Shell fuel station on your left. 1/2 mile later you pass the church on your right. 3/10 of a mile after that you will be in the High Street with shops visible on both sides of the street. A further 2/10 of a mile will bring you to the "top" end of town and the shops give way to residential properties. 1/10 of a mile later you will be at the traffic lights by St Lawrence Green. 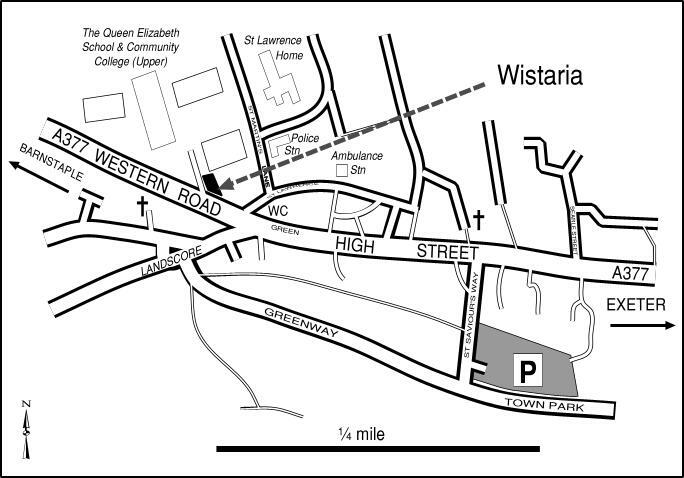 On your right will be College House (part of QECC) and immediately after the traffic lights on the route to Barnstaple is Wistaria Dental Practice. Parking is as above.